A statue of a cartoon bear has been removed from outside China's securities regulator after complaints that it was making a middle-finger gesture at the building. 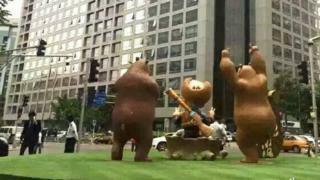 Statues of two characters from the popular Boonie Bears cartoon had been installed opposite the China Securities Regulatory Commission (CSRC) headquarters in Beijing, as part of an attraction marking Children's Day, the People's Daily newspaper reports. But it wasn't long before one bear's paws caught the attention of passers-by, with two outstretched digits apparently aimed at the government building. Both statues were subsequently taken down and replaced with cartoon monkeys. Zhu Lei, who was in charge of the Boonie Bear attraction, says the CSRC called to complain about the bear's "impolite hand gesture". They said it was "as if it was putting its middle finger up at them", he tells Beijing Youth Daily. "But a bear only has four fingers, it would not give a middle finger." The gesture may not have been the only issue though - the term "bear market" refers to falling share prices and widespread selling, and mid-June marks a year since China's financial market turmoil began. That fact has not been lost on Chinese social media users. "Who knew the CSRC's leaders were superstitious," says one on the Beijing Youth Daily website. Many others find the bears' expulsion amusing, with some cracking jokes at the traders' expense. Another simply declares: "These rotten stock exchange people are too sensitive." Mr Zhu says the Boonie Bears have now been consigned to a store room in order to avoid any further trouble.